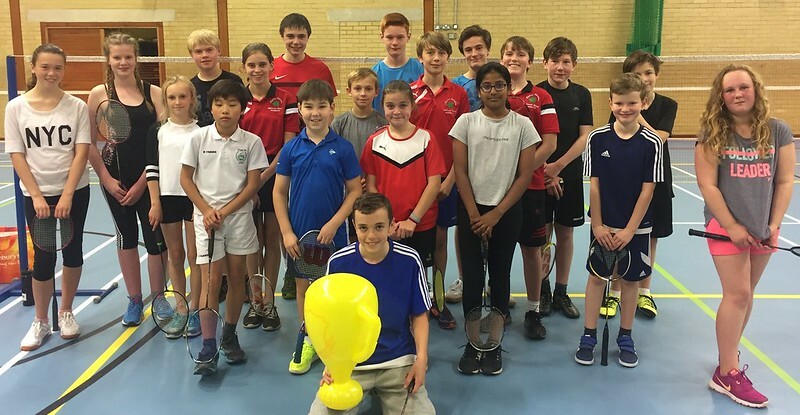 Earlier this evening, 20 players from junior badminton clubs around the county (Pittville, Balcarras, GL1 and Falcons) participated in a time attack event. This style of event gives players the opportunity to put the coaching and training they receive at their clubs into practice by playing games with, and against, players from different clubs. To ensure players get to play with as many other players as possible, games are limited to 10 minutes. All the players were able to play at least 6 games during the event. Congratulations to Connor (Balcarras) who was able to score a total of 166 points across all of his games, earning himself our novelty inflatable trophy and a box of chocolates. Also well done to Felix (Balcarras) and Matthew (Falcons) who scored 160 and 158 points, respectively. Whilst we were totalling up the scores, we set players the challenge of having to backhand low serve shuttles into a target. Anyone who managed it won some chocolate. We were really impressed and pleased to find out that we didn't have much chocolate left by the time we had calculated the final scores, so well done to everyone! Once again this style of event seemed to go down really well and we hope all players enjoyed it. We are looking to run these events every couple of months so keep an eye out for details of the next event!